INSTANT NEW YORK TIMES BESTSELLER"An unbelievable debut, one that announces a new and necessary American voice." --Tommy Orange, New York Times Book Review"An excitement and a wonder: strange, crazed, urgent and funny." --George Saunders"Dark and captivating and essential . . . A call to arms and a condemnation . . . Read this book." --Roxane GayA National Book Foundation "5 Under 35" honoree, chosen by Colson Whitehead Winner of the PEN/Jean Stein Book Award Finalist for the National Book Critics Circle's John Leonard Award for Best First BookA piercingly raw debut story collection from a young writer with an explosive voice; a treacherously surreal, and, at times, heartbreakingly satirical look at what it's like to be young and black in America. From the start of this extraordinary debut, Nana Kwame Adjei-Brenyah's writing will grab you, haunt you, enrage and invigorate you. By placing ordinary characters in extraordinary situations, Adjei-Brenyah reveals the violence, injustice, and painful absurdities that black men and women contend with every day in this country. These stories tackle urgent instances of racism and cultural unrest, and explore the many ways we fight for humanity in an unforgiving world. In "The Finkelstein Five," Adjei-Brenyah gives us an unforgettable reckoning of the brutal prejudice of our justice system. In "Zimmer Land," we see a far-too-easy-to-believe imagining of racism as sport. And "Friday Black" and "How to Sell a Jacket as Told by Ice King" show the horrors of consumerism and the toll it takes on us all. Entirely fresh in its style and perspective, and sure to appeal to fans of Colson Whitehead, Marlon James, and George Saunders, Friday Black confronts readers with a complicated, insistent, wrenching chorus of emotions, the final note of which, remarkably, is hope. 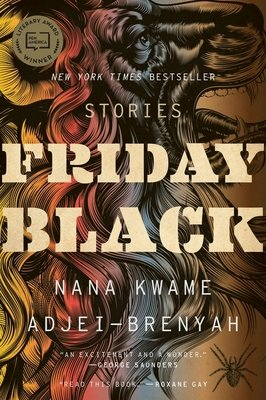 In Friday Black, Nana Kwame Adjei-Brenyah has written a powerful and important and strange and beautiful collection of stories meant to be read right now, at the end of this year, as we inch ever closer to what feels like an inevitable phenomenal catastrophe or some other kind of radical change, for better or for worse. And when you can't believe what's happening in reality, there is no better time to suspend your disbelief and read and trust in a work of fiction  in what it can do.... Friday Black is an unbelievable debut, one that announces a new and necessary American voice. This is a dystopian story collection as full of violence as it is of heart. To achieve such an honest pairing of gore with tenderness is no small feat. ...[an] impressive debut story collection... There's enormous talent on show in Friday Black but the real fun will come in watching the student's attempt to escape the shadow of  or even surpass  the master. The stories generally succeed in their fantastical set-ups. They sometimes fail in their details.... Despite the occasional stylistic hiccup, this high-concept and morally rich collection is discomfiting and moving, savage in its social critique yet generous towards its characters. It ends with a lovely, tempered note of hope.... The stories that Adjei-Brenyah tells are terrifying. But, in our reading them, at least we're not alone.